On October 21, 2014 a few of the team members from A2 were there to participate in a Kansas City philanthropy, TeamSmile. TeamSmile is a 501C nonprofit dental organization. Their mission is to create connections between children’s service groups, dental professionals, professional sports organizations and their athletes. They work to provide underserved children in need, a life changing dental experience in which the excitement and allure of high profile sports reinforces the value of a life-long commitment to dental health care. Each child in our program is provided with free preventative care and education, and if necessary dental treatment. The co-founder of this philanthropy, Dr. Bill Busch, who is also the owner of the North Kansas City Dental Group, had contacted us asking if we would help create a social media buzz at this special event. The event took place at the KC Chiefs stadium, a stone’s throw from where the KC Royals were gearing up for game 2 of the World Series. It was doubly exciting. Creating a buzz is exactly what we did. Armed with TagBoard we worked he crowd encouraging peeople who were taking photos and posting on their social media channels, to post with the #TeamSmile. 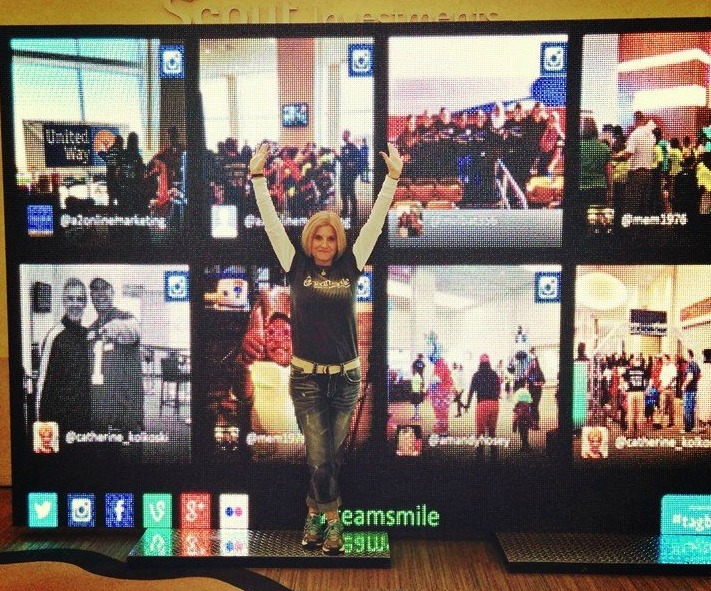 This #hastag allowed us to curate the posts into one giant board where participants and volunteers could see themselves and their posts on the 10 X 30 foot wall of video screens and the many LCD TV’s throughout the Stadium Club. The TagBoard is embed in the homepage of their website where we continue to moderate and update the more recent posts as #TeamSmile events take pace around the U.S. with NFL, MLB and NBA teams! To find out more about TeamSmile or how you can volunteer, go to their website and LIKE their Facebook page. Catherine is the Founding Partner of A2 Online Marketing. Lead generation, business development and content writing are a few of her strengths.